EMORY (US)—Using CT or MRI to image epicardial adipose tissue, the layer of fat around the heart, provides extra information compared with standard diagnostic techniques such as coronary artery calcium scoring. “This information may be used as a ‘gatekeeper,’ in that it could help a cardiologist decide whether a patient should go on to have a nuclear stress test,” says Paolo Raggi, professor of medicine (cardiology) and radiology, and director of the cardiac imaging center at Emory University. Results from two imaging studies were presented recently at the American College of Cardiology meeting in Atlanta. The first study, presented by cardiology fellow Nikolaos Alexopoulos, now at the University of Athens, Greece, shows that patients with a larger volume of epicardial adipose tissue tend to have the types of atherosclerotic plaques cardiologists deem most dangerous: non-calcified plaques. Calcium tends to build up in atherosclerotic plaques. Even though the heart’s overall coronary calcium burden is a good predictor of heart disease, calcium in an individual plaque doesn’t necessarily mean imminent trouble, Raggi says. 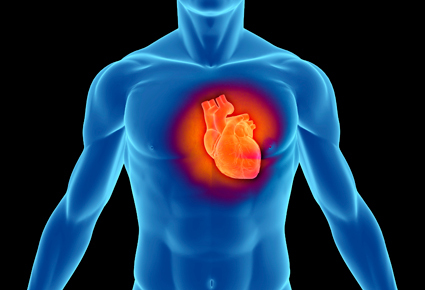 Non-calcified plaques indicate active buildup in that coronary artery, and studies suggest that the fat around the heart secretes more inflammatory hormones, compared to the fat just under the skin. “Release of inflammatory factors from epicardial adipose tissue may be promoting an active atherosclerotic process, and this is indicated by the presence of non-calcified plaques,” Raggi says. Researchers examined 214 patients through cardiac CT, and performed coronary artery scoring as well as assessing the patients’ epicardial adipose tissue volume and the plaque in their coronary arteries. The epicardial adipose tissue volume was highest in the patients with non-calcified plaques (roughly 60 percent more than those with calcified plaques). The second study, presented by Emory cardiology fellow Matthew Janik, measured epicardial fat in patients receiving a nuclear stress test. The 382 patients had chest pain but did not have known cardiovascular disease. A nuclear stress test picks up signs of inducible ischemia: deficiencies in blood flow in the heart muscle. Here, the researchers found that the presence of ischemia correlated more closely with epicardial adipose tissue volume than with the coronary calcium score. Can a probiotic pill fight cavities?